Osborne Industries, Inc. – Osborne, Kansas – It is well-known many fast food chains and consumer driven organisations are announcing their opposition to purchasing pork from producers who use gestation stalls. Specifically, in 2012, McDonald’s USA announced that by 2022 they will no longer purchase from producers who use gestation stalls, providing ten years for producers to move from stalls to an alternative form of loose sow housing. These ever increasing announcements from giant food chains, major grocers, and pressure from animal rights activists have started to drive US producers to a point of no return: Adopt an alternative form of sow housing or risk losing a major market for their pork. Currently, there are nine states in the US that have laws prohibiting the use of gestation stalls for pregnant sows and many experts expect this number to rise in coming years. There are a number of different loose housing gestation systems used in the US, but it appears that no one type stands out as the most popular alternative to individual stalls. Since its development in the late 1980s, Electronic Sow Feeding (ESF) has gained substantial popularity in the European Union due to animal welfare regulations. More recently, a total ban on the use of gestation stalls from four weeks after breeding went into effect on January 1, 2013, for member states. While ESF satisfied the requirement of the stall ban, producers who implemented ESF into their operation discovered the many benefits of improved animal performance and behaviour. US producers have been resistant to introducing a form of loose sow housing into their farms, especially ESF. This resistance may have more to do with the producers’ concern that moving sows into groups will negatively affect production. There is a comfort with gestation stalls because they have been standard in confinement buildings for many years, and producers have learned how to efficiently manage animals that way. Additionally, existing US farms have a big investment in their facilities and converting to ESF requires an investment in new equipment. Producer fears are also fueled by errors made in managing animals during ESF’s infancy. Furthermore, US veterinarians and producer alliances generally do not endorse or oppose ESF. Some leading US producers have announced going stall-free without communicating the path they are taking. This, along with the added confusion of comparing ESF with alternative feeding methods, leaves many US producers scratching their heads. Successful group management using Electronic Sow Feeding requires the adoption of a complete system, including the equipment, facilities, animal behavior, and sow management methods. Understanding each element of an ESF system will ensure proper operation and optimum performance. When an ESF system is embraced, properly managed, and supported, research studies conducted in the US show little to no effect on KPI (Key Performance Indicator) values when compared to stalls. It is important that producers understand ESF before implementing the system into their operation. The system has a number of components: the use of radio frequency identification (RFID) technology to individually identify animals with ear tags, a non-competitive feeding station for animals to eat privately, entrance and exit gates that prohibit other sows from entering during another’s feeding time, and a computerised system and software package that allow producers to set an animal’s individual daily feed ration. Because of the technology involved in this automated feeding system, it is essential for producers to have a close working relationship with suppliers to ensure the long-term success of the system. The software, feeding station, and animals must be continuously monitored to receive the most benefit from Electronic Sow Feeding. As producers shift their management paradigm from stalls to ESF, technical support, availability of replacement parts, and ongoing system training are key. An ESF system allows each gilt or sow to be fed based upon their stage in gestation and their individual body condition score, giving producers a powerful tool to save feed and achieve more uniformly conditioned and productive groups. Animals are free to move and exercise at all times, which enhances the gestational development of the piglets to be born. Litter sizes and weights are optimized with proper nutrition and exercise. ESF provides the precise amount of feed required to support a healthy litter in a non-competitive environment. With alternative group housing methods like floor feeding, ‘boss sows’ often become over-conditioned. The natural social order of swine limits some animals from receiving the vital nutrients necessary for a healthy gestation. Feed wastage is minimised with ESF because individual animals are target fed. Competition is eliminated, and animals are fed precisely. They are provided the necessary time to eat their meal, and nothing is lost in the pit. With feed generally representing 60-70% of production costs, ESF is a valuable aid in reducing wasted feed. Some ESF users have reported significant savings in feed, amounting to nearly 1 pound (0.45 kg), per sow per day. This can generate the payback of an ESF system in less than two years. The efficiencies can be further retained in subsequent years, making converting to ESF more attractive than any of the other group managed sow systems. Improved animal behaviour is another important benefit of housing sows in groups with an ESF system. Sows learn to disassociate farm personnel with their feeding time, thus allowing them to develop more docile and natural behaviour. With proper system layout, sows also quickly discover well-defined areas for eating, drinking, laying, and urinating/ defecating, providing a more pleasant environment for animals and workers, with better air circulation and less noise. Electronic Sow Feeding allows employees to work with animals instead of against them. 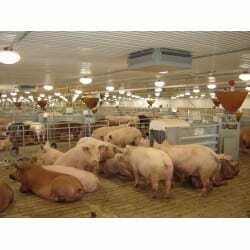 It is unreasonable to assume there is one concrete answer to the issue of sow housing in the US With so many options available to producers and no nation-wide government regulation on the use of gestation stalls, producers in the US should continue to study and learn more about Electronic Sow Feeding as a viable alternative. ESF is a practical answer to the welfare issues being raised by consumers; however, often overlooked are the many benefits that producers can realise by implementing the system. ESF has the potential to be the most efficient and effective alternative to using gestation stalls. The system feeds animals in a protected feeding station and based upon their individual stage in gestation. Animals are free to exercise and find their own comfort area. ESF can increase efficiency, accommodating large groups of animals. As time passes, and more packers get their pork from stall-free facilities, how quickly will it become required for all producers to adapt to 100% stall-free housing for their sows? And as the number of sows housed in stalls continues to decrease in the US, more and more producers will need to determine the path they will take to remain in business in our changing industry.